Candace Cortiella, introduced in an earlier chapter, is the director of The Advocacy Institute, a nonprofit organization that develops projects, products, and services aimed at improving outcomes for children with disabilities—not just learning disabilities, but all disabilities. One of the institute’s core activities is training Special Education advocates who work on behalf of parents and families. Candace is also the author of the IDEA Parent Guide so often cited in previous chapters, and I can think of no better person to talk to about the world of Special Education advocacy and the benefits and drawbacks of obtaining the services of an advocate for your child. I began by asking what propelled Candace into the role of advocate. “ What most often influences parents to make the very serious decision to hire an advocate?” I asked. “ Yes, and often that is the best way to handle things. But if we go with the example you used of the mother not being able to understand the results of an evaluation, it is important to let parents know that schools have an obligation to provide parents with information that they can understand. It’s very appropriate for a parent to say to a school, ‘I need an opportunity to have an interpretive meeting about this evaluation before we go further in this process.’ I was fortunate in that my daughter attended a school district that was rather large and sophisticated, and that practice was routine. They wanted parents to understand the evaluation results. A state-by-state listing of these centers can be found at www.ld.org/aspecialmother. “ What is the success rate for a parent who wants a more inclusive environment for her child?” I asked. Candace hesitated. “That’s a little difficult to answer,” she said. “ Why would someone go through all that?” I asked. I asked Candace if it is common (in her experience) for a school to reject services a parent feels the child needs. “ That’s right,” Candace said. “ What do you mean?” I asked. In that light, I would also like to mention the work of Pamela and Peter Wright, founders of the Wrightslaw Web site (www.wrightslaw.com). For years, whenever a legal question came up from one of the thousands of mothers who called NCLD, we always directed them to the Wrights. 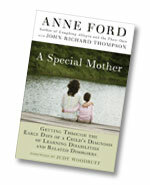 They are experts in the field of Special Education law and have written several books. Many mothers have found their book From Emotions to Advocacy to be particularly helpful. For more about the work of the Advocacy Institute and advocacy in general, please visit their Web site at www.advocacyinstitute.org. Copyright © 2010 Anne Ford. All rights reserved.